Japan’s Sōta Yamamoto performs his long program at the 2015 World Junior Figure Skating Championships. 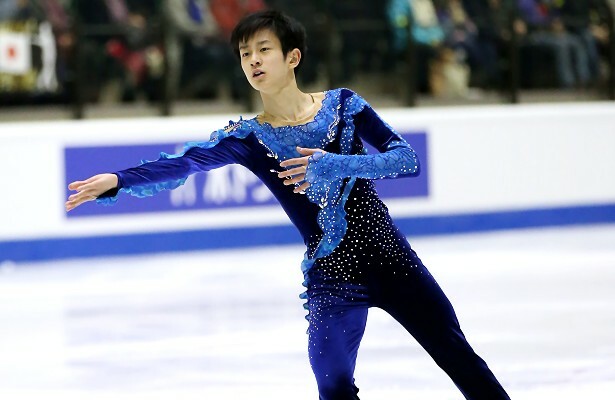 Japan’s Sōta Yamamoto, who debuted on the ISU Junior Grand Prix (JGP) two years ago, has his sights set on the World Junior Figure Skating Championships title. Ever since Daisuke Takahashi took the gold in 2002 in Hamar, Norway, Japan has produced more winners than any other country to date. Yamamoto’s goal is to join those ranks. Born in Osaka, Japan, in 2000, Yamamoto started skating after he watched Russia’s Evgeni Plushenko’s performances at the 2006 Olympic Games in Torino, Italy. In fact, because of his long limbs, slim body line and huge jumps that remind people of his idol, the Japanese media have taken to calling Yamamoto “Hanyu II.” This unfortunately also reflects the expectations placed on the young skater; especially after he delivered good results at the JGP series last season where he placed second in France and Estonia, as well as the Final in Spain. Like his idol, Hanyu, who is considered the best in the class in all single’s elements such as jumps, spins and skating skills, Yamamoto also pursues to be an all-around skater. Nevertheless, the 2015 World Junior bronze medalist revealed that his focus this season is to enrich his arsenal of jumps. He is aiming to stabilize the triple Axel, which he started to add to programs last season, and is also planning to add the quadruple toe. Yamamoto opened his season earlier this month at a regional event called “Summer Cup” in Shiga, Japan. The skater fell on an attempted quad toe and also popped both of the triple Axels in his free skate. Although he won the event, he felt “frustrated” with the total score of 194.56 and his overall performance. Aside from the jumps, the Summer Cup winner also realized that he needs to keep the delivery of choreography in mind during competition. This season, the skater decided to replace both his short program, which got him a junior world record score in Barcelona, Spain, and the long program. His new short program is a flamenco piece entitled “Poeta” by Vicente Amigo, which former world champion Stephane Lambiel used to skate to for two seasons. Although Kenji Miyamoto choreographed this program, Lambiel himself gave Yamamoto some advice during a training camp arranged by the Japanese Skating Federation. Looking ahead into the upcoming season, Yamamoto said his biggest goal is to “win the junior world title,” however, he clearly stated it wasn’t going to be easy. Coincidently, Yamamoto will be going up against Chen, who placed fourth at the junior worlds last season, at his first JGP event next month in Colorado Springs, Colo. Regarding this re-match, the Japanese teenager, who overtook Chen by a mere 1.6 points in Tallinn, Estonia, doesn’t feel he has any advantage. Although this early match-up may increase the difficulty for him to earn points to qualify for the JGP Final, the defending silver medalist expects some positive learning from it. The junior world title is not Yamamoto’s only goal this season. The teenager is also eyeing the national podium at the senior level—the event he finished sixth last season. Japan arguably has the deepest field in the world in the men’s discipline of figure skating, and Yamamoto is very well aware of the high rate of difficulty that his competitors are bringing to the table. The 15-year-old further revealed more of his thoughts on the upcoming 2018 Olympics. However, the ambitious skater realizes that it’s too early to focus on Pyeongchang now. “I need to first pay attention to every upcoming competition, tackle the problems that I find one by one, and reflect the good learning into future,” he summed up.